I think I had admitted more than once that reminders (and organization in general) is not really my thing. Still I got hooked on Resnooze (it even made list of best stuff). 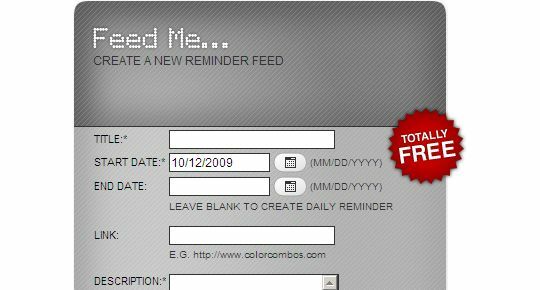 ReminderFeed is online reminders service that looks similar in design and mechanics to Resnooze but uses RSS as medium. And I am willing to check anything RSS. Service allows to setup daily reminders for specific duration (from date to date). No account is needed and there is option to protect reminder from edits. Otherwise it can be edited by anyone who knows direct reminder URL. For every reminder there is RSS feed provided. It will change daily with new instance of reminder. Previous one is removed. This way it won’t keep history if there were edits, otherwise works fine. In theory it would make sense to use in-future records for feed mechanics, but few feed readers process that properly. ReminderFeed is probably at best for reminders shared by several people. It is near-instant to setup and it is easy to distribute link to feed, without any need for signups or gathering personal details like email addresses. Service is up for several years. but it seems like there weren’t many features added to it. I see no way for such basic tweaks as interval or time of day to generate reminder at. It does perform core function but lacks polish and precision that could get it on par with Resnooze. Service is very focused and while it could fine plenty of use where RSS as medium is important, altogether function set is limited. Can you make public feeds to share with Google calendar? I hadn’t used that service at all. Rarst – I am not sure if a separate public feed can be created. Basically, you can get a feed address for your entire Google calendar. If you want to make it as a public feed, then that feed address can be shared. But doesn’t sounds like a good idea, and even Google doesn’t recommends that. But if someone really needs to share for a limited time, then they can use that feed address. Google provides a simple mechanism to reset that feed address at any time. So, whenever you want to stop sharing, just reset the address.